Background: Airlines offer their top products on the long transcon routes across the United States. Flat-bed seats, upgraded meals and departure lounge access come together to make for a uniquely premium experience on these flights. Competition is intense, leading to innovative product offerings and the best travel experience you can find domestically. I have been fortunate to try several transcon offerings in recent years. My first was United Airlines P.S. "Premium Service" on a B757-200 on their former JFK-SFO route. 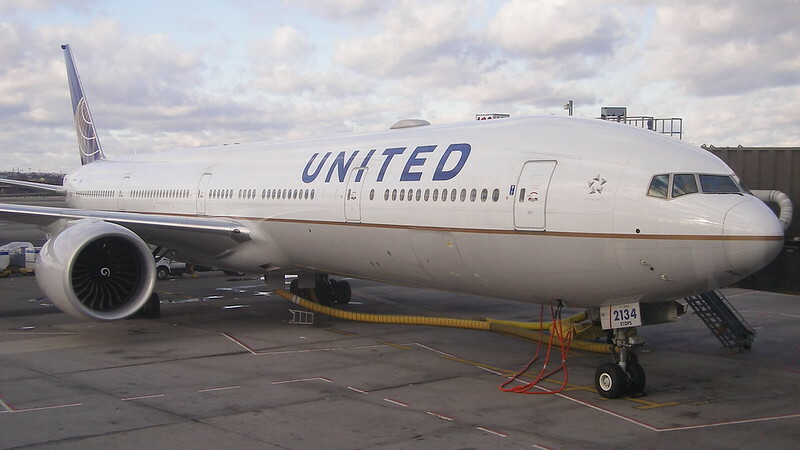 Shortly after that flight, United ceased flying to JFK in favor of offering the P.S. flights out of their nearby EWR hub. I personally live 3h from JFK and 2h from EWR, so my initial inclination would be to favor this change. 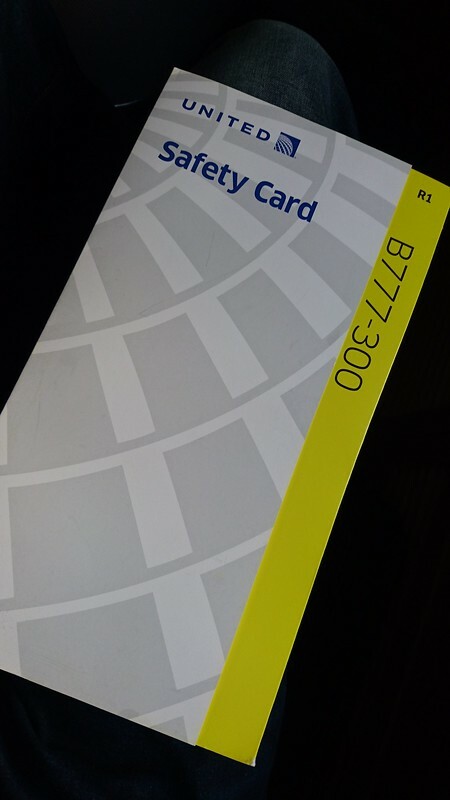 But for my UA JFK-SFO flight, which was probably my top domestic flight at the time, the ground experience at JFK had left a lot to be desired, with no premium check-in available, unfriendly agents, disorganized security, and quite a poor-quality lounge pre-departure. I hoped that the change to EWR would result in improvements in these areas. Since then I have flown transcon with Alaska Airlines SEA-PHL on a B737-900ER, American Airlines SFO-PHL on an A330-200, and Virgin America PHL-SFO on an A320. Virgin had become my top domestic flight, sadly only to be phased out after being purchased by Alaska. After these experiences I was looking to try United P.S. again. This year was the perfect opportunity, seeing as how these end-of-the-year flights would give me Premier Platinum status for the first time. 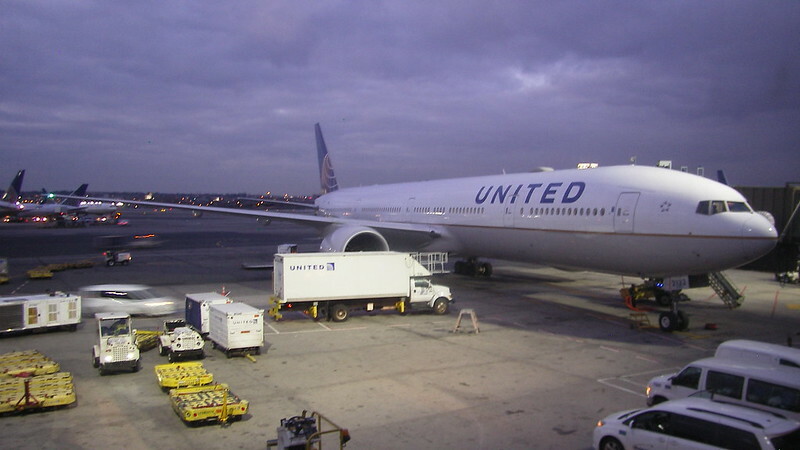 The flights became even more appealing when UA began operating aircraft besides the typical P.S. B757-200 on select flights. 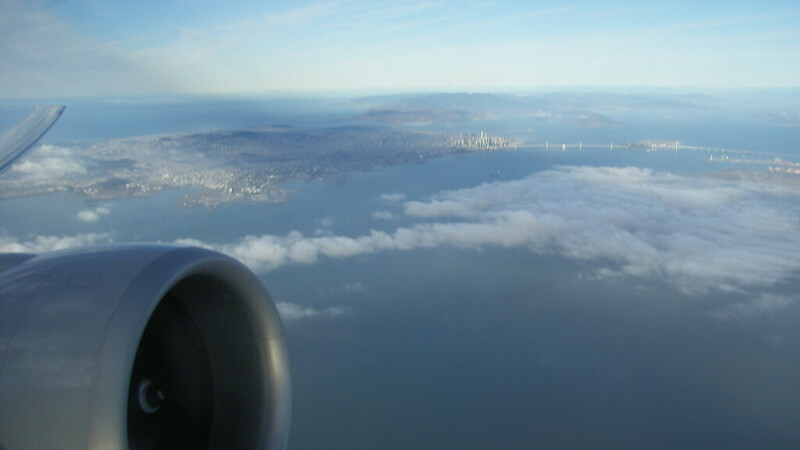 I booked business class EWR-SFO (continuing on to LAS) and then returning SFO-EWR. After booking, UA changed the equipment for my flights to the B777-300ER, a most welcome change. These flights would be my first on the UA B777-300ER, their current flagship. 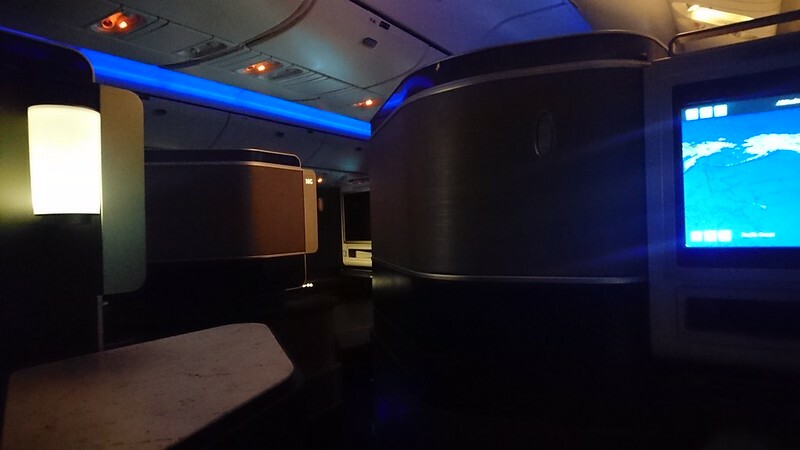 I would get to fly in the new Polaris business class seats, which I definitely enjoyed when I had tried them six months prior. 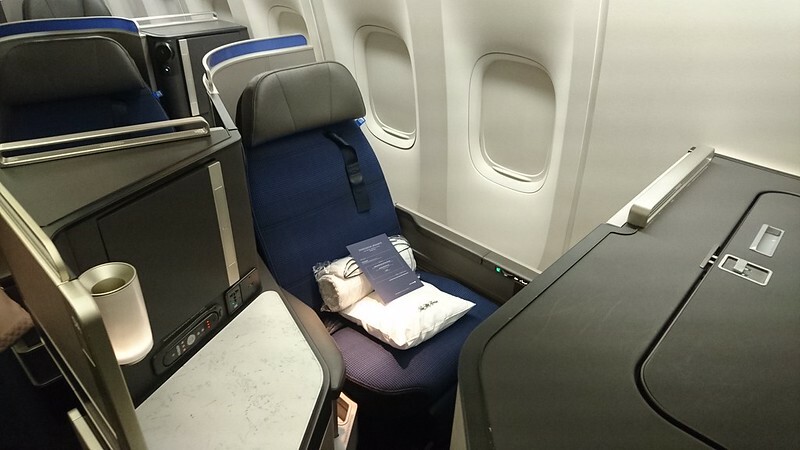 Combining the B777-300ER with the Polaris seats and the "premium service" offering, I had high expectations indeed, and was totally looking forward to flying cross-country. Please enjoy the reports, and I look forward to your comments. I began my experience by enjoying curbside check-in, one of my new favorite things that I've been using more and more often. I found no security line, and was airside by 12:35. Boarding was set for 15:10, and departure for 16:00. I had made it to the airport earlier than expected due to my public transit connections working better than planned. It was good to be early because EWR Terminal C has good restaurants for lunch, plus business class P.S. transcon flights come with lounge access. 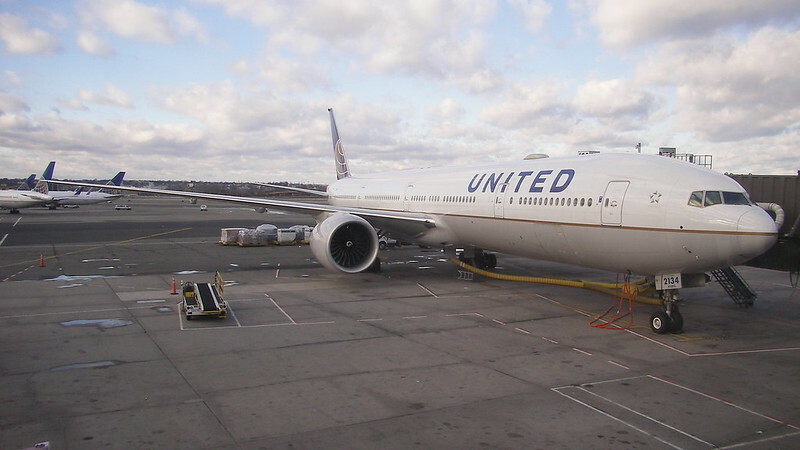 I was excited for my flight, my first on United's B777-300ER. My day got off to an even better start when my lunch was comped courtesy the United Chase card. I had read about people receiving surprise meal credits at EWR restaurants when paying with the Chase card, but had never expected it to happen to me. And despite being a few days before Christmas, EWR was quite empty, much emptier than all my other United EWR flights this year. As I enjoyed my comped lunch, I didn't even make it to the United Club. Instead I proceeded straight to the gate about 30 minutes prior to boarding. I was excited to see a large widebody at my gate. You can't beat a domestic widebody flight! My aircraft was N2534U. Pre-boarding commenced on time, beginning with people with disabilities, then active military, Global Services, and people traveling with children under 2, followed by a special announcement for Premier 1K. By now there was already quite a backup in the jetbridge. Most of those who had pre-boarded didn't get much farther than the boarding pass scanner. Next Group 1 was invited to board, and fortunately the backup had cleared so we could head straight down the jetbridge into L2. I turned right into the second Polaris cabin, and headed back to 17L. This is the second-to-last row in the Polaris cabin, but the last row with the seat adjacent to the window. 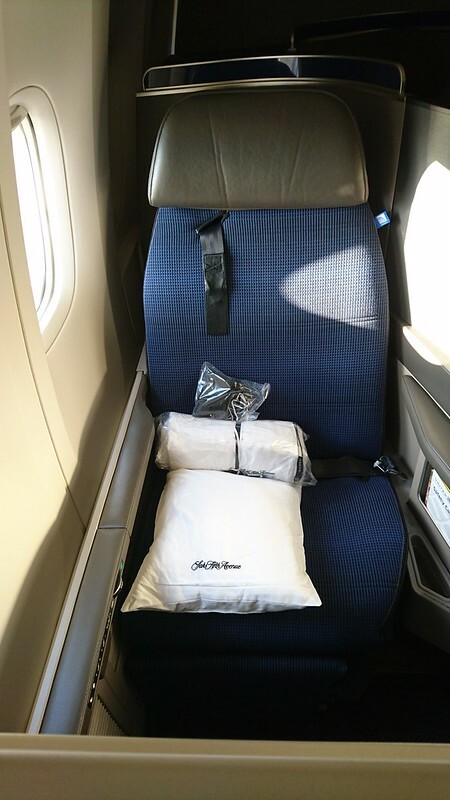 The seat had a pillow, Saks Fifth Avenue blanket, and Saks Fifth Avenue amenity kit. I was very happy to settle in to my Polaris window seat. The seat had a large footwell, despite not being a bulkhead seat. We'll compare it to my return flight in the bulkhead. The seat was just as I remembered from my previous B767-300ER Polaris flight: a very stylish and modern seat. 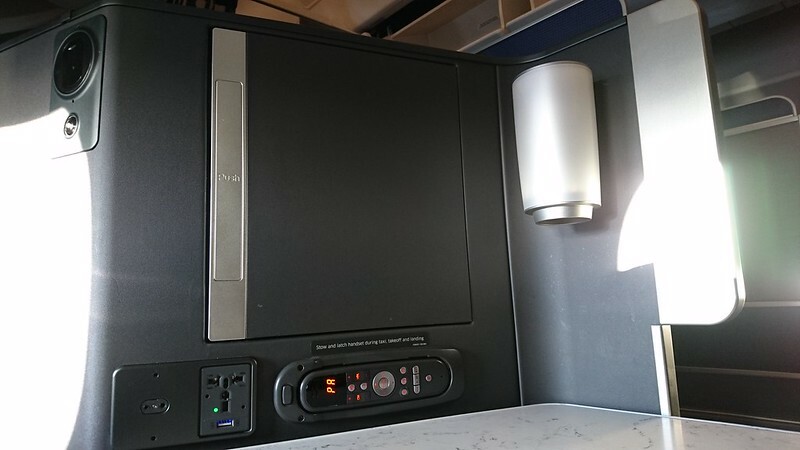 There was a large screen, a large side table to my left between the seat and the aisle, and a storage closet above the side table which contained the headset. I had an electrical outlet, a dual-prong headphone port, and the IFE remote to my left. I also had a coat hook to the left of the screen. 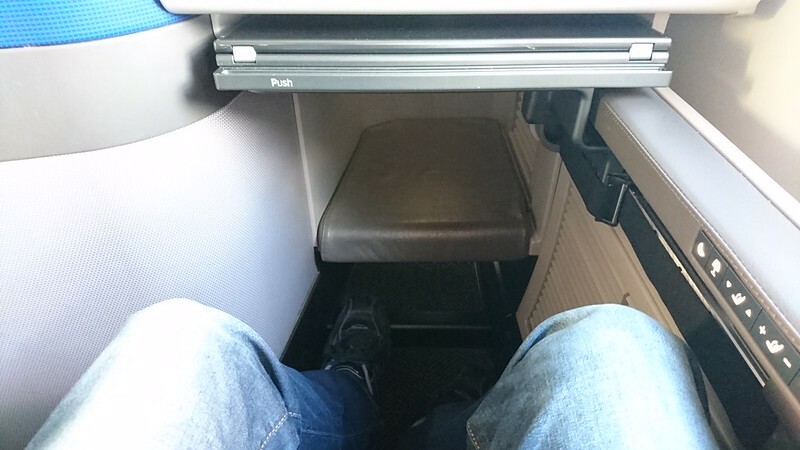 Under the screen was a small magazine compartment, a USB port, the stowed tray table, and the large footwell, beneath which was yet another storage area. To my right, I found two full windows and the seat controls. I had my whole overhead compartment to myself. I still really like the United Polaris Business class. 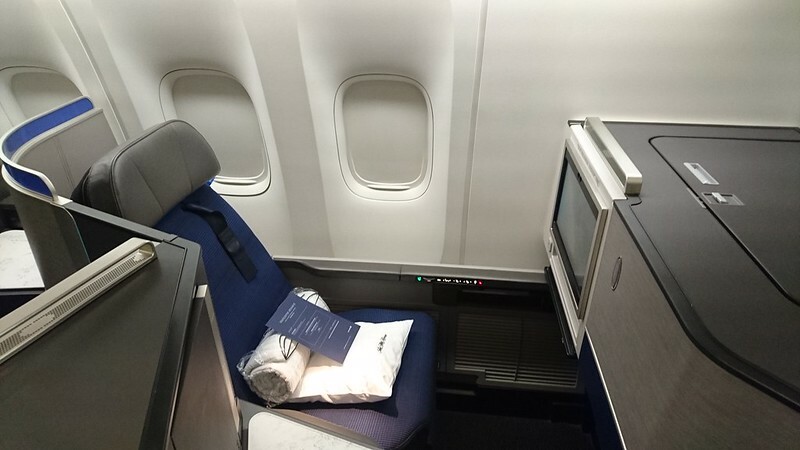 Like I said, stylish and modern, a seat competitive with any international business class seat, but here I am about to enjoy it domestically on a transcon. The odd-row window seats were directly beside the window, with the side table between the seat and the aisle. 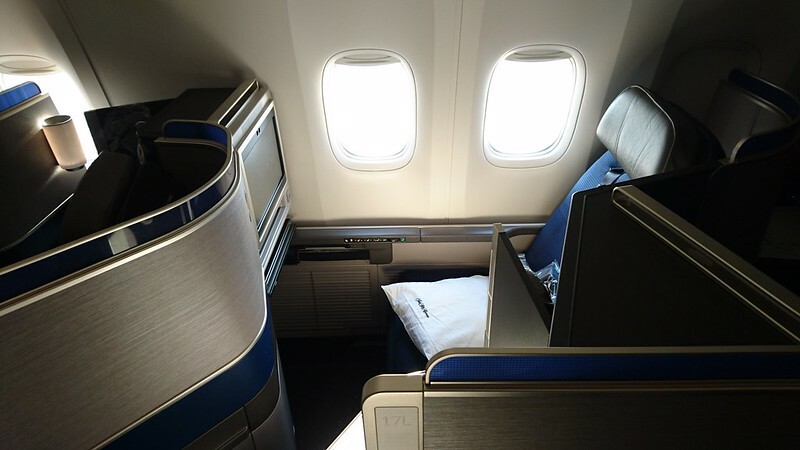 The even-row window seats had their side table between the seat and the window, but the seat wasn't parallel to the aisle, rather it was angled towards the aisle for slightly more privacy. The first Polaris cabin, from doors 1 to 2, had rows 1 to 8, and the second cabin, aft of door 2, had Polaris rows 9 to 18. Aft of this cabin was Economy Plus, followed by Economy. 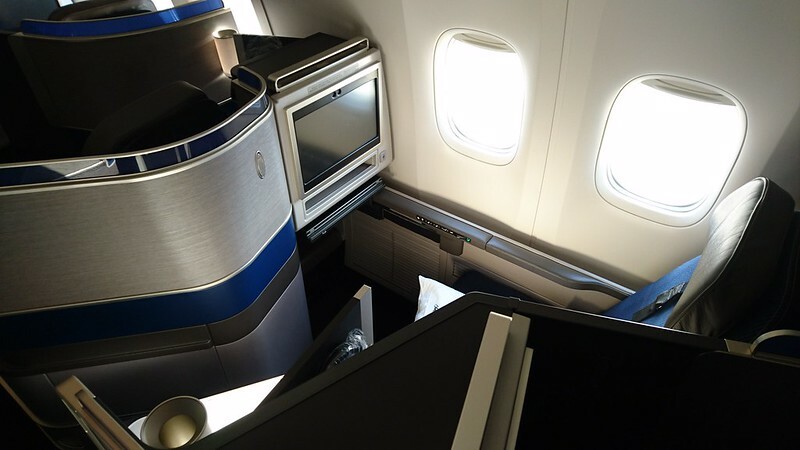 United is reconfiguring the B777-300ER with Premium Plus, a full premium economy, but this aircraft didn't have it yet. The IFE was showing an arrival 30 minutes early, and I found a good selection of movies available for this long transcon fight. Passengers' coats were not hung, but only about a third of the overhead compartments had anything inside, so I personally did not mind simply placing my coat overhead. 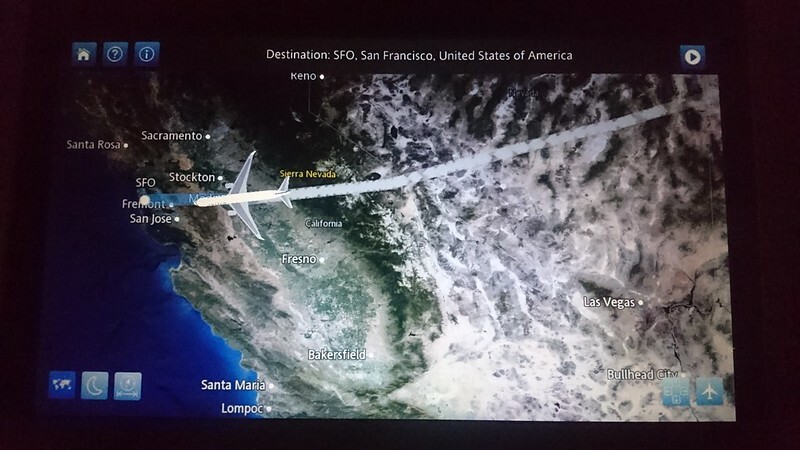 The captain advised a flight time of 5h29, and said he was expecting turbulence on climbout but otherwise a smooth ride to San Francisco. 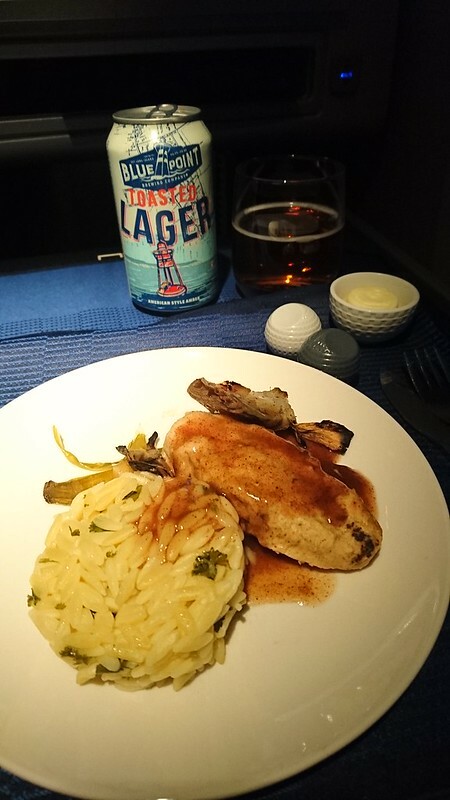 I thought the lack of a pre-departure beverage was a bit disappointing; I don't really care about it myself, but it is a nice touch, and when the first domestic flight I've had this year where the PDB were skipped is a "Premium" transcon, well I would expect better. While PDB weren't offered, menus were. And then the safety video started to explain the features of our triple-seven three-hundred series aircraft. Pushback occurred during the video at 16:08. My seat was directly beside the engine at the leading edge of the wing, so I was treated to a pretty loud engine start. The B777-300ER had quite good engine noise; newer planes like the A350 and B787 are a lot quieter. During taxi I spotted the Lufthansa B747-8. 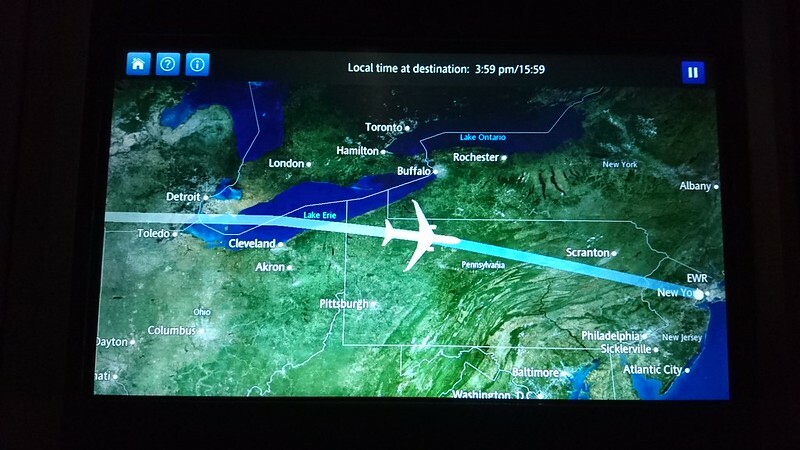 I'm glad LH sends the 747 into my home state, and I flew on it about eight months ago. We were Number 2 to takeoff, after a Porter Q400. Our takeoff was from 22R at 16:23. We began with a very slow turn onto the runway, then thrust increased as cabin crew scrambled to be seated. I enjoyed a decent pushback into the seat; I didn't feel too much speed, but we quickly lift off. I had enjoyed pretty decent engine noise, and as we climbed to cruise altitude, it was not too quiet but also not too loud. 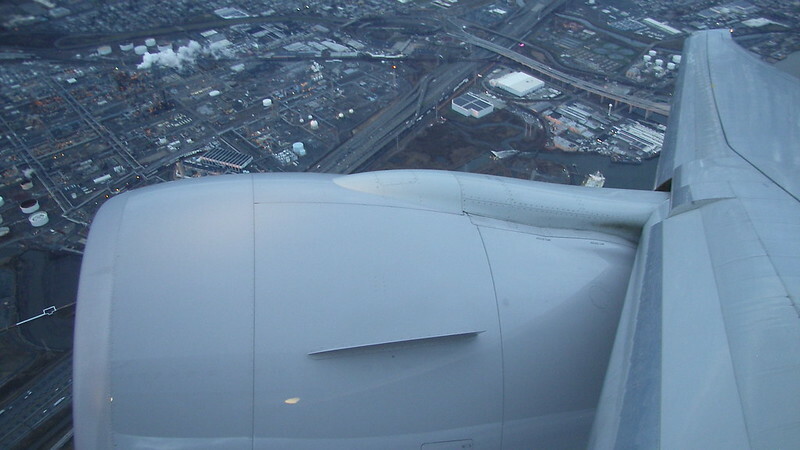 This engine noise simply contributed to the typical airplane white noise. Curtains were shut to Economy Plus behind, and also there was a window in the center bulkhead, which was also shut. When the seatbelt sign went off, it was time for a bathroom break. There were two lavatories between the forward and aft Polaris cabins. I tried the 2L lav, finding it twice the size of typical airplane lav and smelling very clean. After I returned to my seat, I decided that a trip during the Christmas season called for watching some Christmas movies. I began with Home Alone. Hot scented towels were offered as meal orders were taken. I requested the chicken, Grilled Chicken Breast, with kale pesto, orzo with herbs, artichoke, leeks, and semi-dried tomatoes. "Second option?" Disappointed that UA continues the "second option" practice, seemingly unable to cater the correct number of meals and also unable to offer meal pre-orders, I chose the beef, Seared Beef Short Rib, with Bordelaise, polenta cake, and kale with orange marmelade. "To drink?" 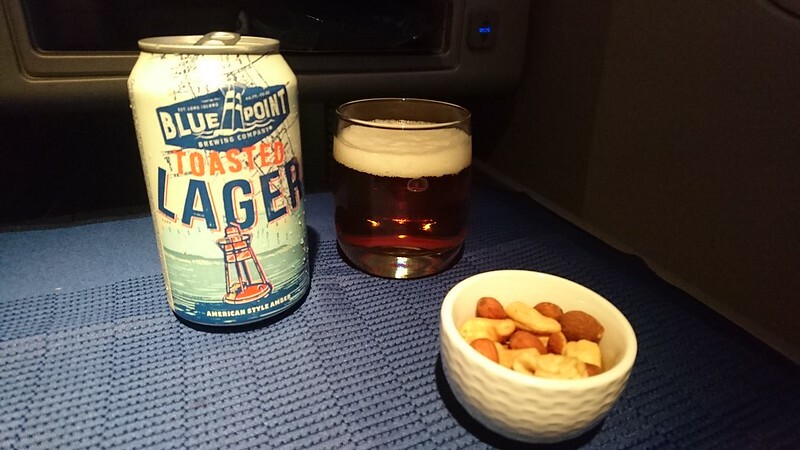 I chose the first of the two craft beers on offer: Blue Point Toasted Lager. The second craft beer was Goose Island Midway IPA. This was honestly a disappointing craft beer selection. They were the same as those on my last United flights six months ago, and both are AB-Inbev faux craft beers. United used to change their craft beer offerings more regularly, and used to also offer non-AB Inbev products, which I would prefer. My table was set, and then drinks were served with warm nuts. I definitely thought there was still a greater degree of white noise near the B777-300ER engine than on other recent aircraft. To me that's a benefit, drowning out other passengers' conversations. Service continued with each passenger being served one at a time from a tray. The appetizer and salad were served, along with a pretzel roll. The chilled appetizer, shrimp with sriracha, honey, lime, and grilled pineapple, was tasty. I had no complaints with the salad, mesclun, fennel, apple, and red seedless grapes, served with dressing. Next the entree was served, and it was very good. It was well-cooked, and the sauce was really nice, I couldn't pick out the exact flavor, but it was delicious, unlike a sauce I've had before. The orzo was a nice side. And I got one beer refill as I finished Home Alone. Continuing with Christmas movies, my next movie was Elf. 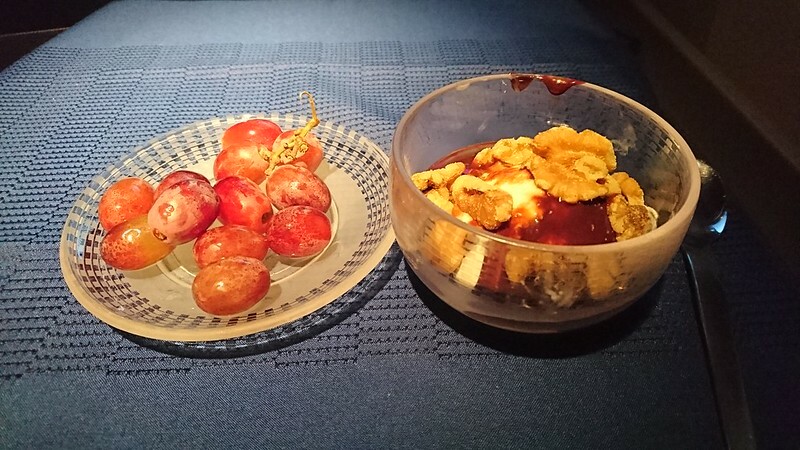 It was soon time for dessert, the made-to-order ice cream sundae always a favorite, as well as a side of grapes. After dessert we were halfway through the flight, and a water bottle was delivered. I was still watching Elf. I took a second restroom break, trying the lav at 2R this time. This one was a normal-size airplane lav, unlike the double-size 2L lav. It was still clean and fresh though. My movie finished with 1h30 to go; we were halfway across the state of Utah. 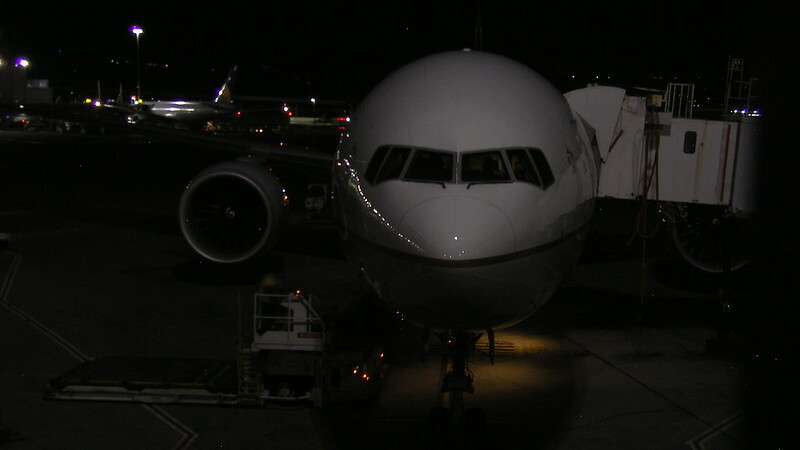 I was still enjoying the B777-300ER white noise sitting right in the vicinity of the engines. It was definitely louder than any recent A350 or B787 I'd flown, where you can hear other passengers' conversations from several rows away. I was also still enjoying my Polaris seat, liking the seat itself as well as the on-demand IFE and direct aisle access. The captain announced that we were to begin descent in 15 minutes. 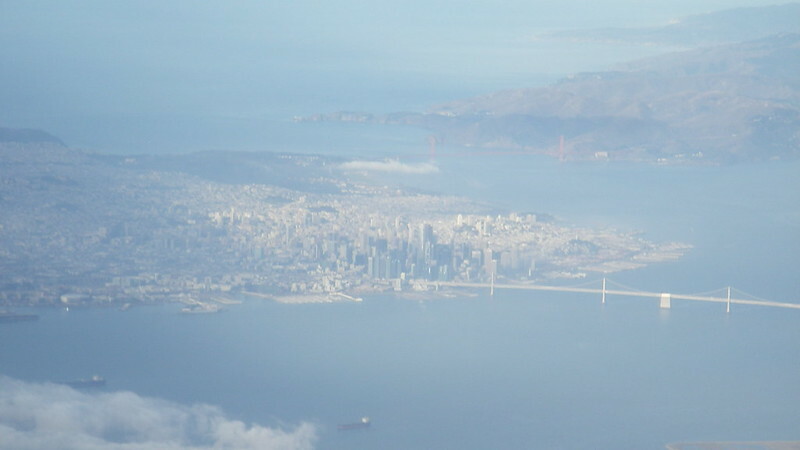 We were currently 45 minutes out of SFO; we will be arriving early at 19:00 into the International Concourse Gate 89. Indeed the next announcement advised that descent had begun and cabin service will be discontinued. After the meal service had concluded, there had been zero further service, and I found that quite disappointing. I thought there was actually less service than a normal long domestic flight, even though my flight today was a "Premium" flight. I clearly remembered a hot cookie service on UA P.S. three years ago, which I guess has since been cut. I guess the main benefit today was the seat, not the service. Compared to UA P.S. three years ago, the meal was very good; it seemed to be a smaller portion, but I won't complain about portion size if the quality is good, and indeed it was. But no service other than the meal, and no cookie service! 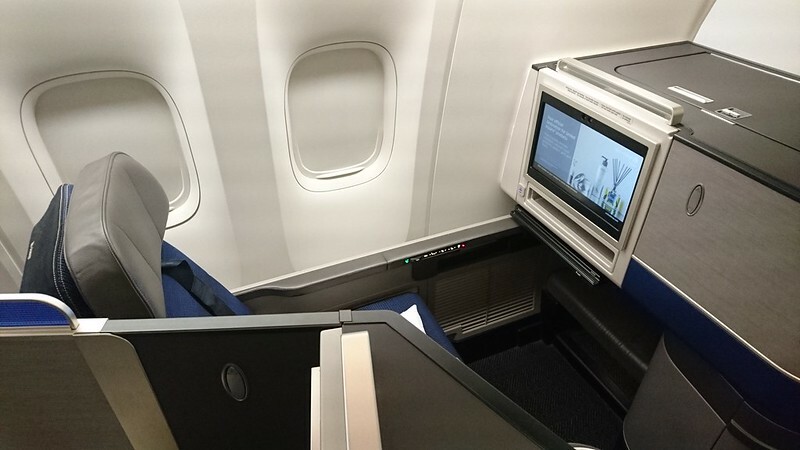 I was naturally very happy with my seat in Polaris Business Class, an excellent seat, comfortable, with good storage, direct aisle access, and individual IFE with a lot of good content. But considering the price paid, the amount of service on offer was really subpar. A meal service with nothing else is what you'd get without paying a premium for this transcon, that's what you'd get on a 2.5h non-premium flight. There was no pre-departure beverage and no pre-arrival snack. I'll withhold final judgment until my return flight next week, where I'll see if these shortcomings can now be expected on a United transcon, or if they were unfortunately unique to this flight today. An announcement advised upcoming turbulence and the need to prepare the cabin. Landing was at 21:55, and we were at the gate at 22:01. Make that 19:01 Pacific Time. During my layover I enjoyed accessing the United Club as part of the P.S. 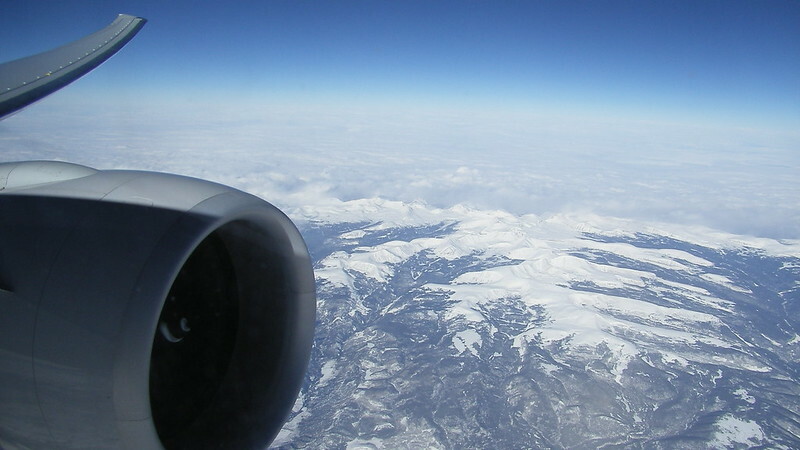 experience before continuing to Las Vegas on a United B737-900ER. My return UA P.S. flight is covered in the next post. I arrived to SFO and again enjoyed a curbside check-in. There was no line at Precheck security, and I was air side by 06:40. Boarding was set for 07:40, and departure for 08:30. Lounge access was again included, so I headed to the United Club. I was looking forward to another flight in the new Polaris seats, which are always good, but I was also hoping for better service than on my outbound flight. I headed to the gate at 07:30, and joined the half-dozen people already in the boarding line. My aircraft today was N2332U, but I couldn't get a good view. Preboarding began on-time, again in the same order as last time: those with disabilities, Global Service members, active military, families with children under two, and finally 1K members. Upon hearing the number "1" in "1K", the people at the front of Boarding Group 1 immediately approached the agent, who did enforce the (pre)boarding order, asking them to step back and wait. It was finally time for Group 1. Two jetbridges were in use. Door L1 was marked for the FGJKL seats, and door L2 was marked for the ABCDE seats. I entered through L2, and again turned right into the second Polaris cabin to find my bulkhead seat 9A - same as last time, a window seat that's parallel to the window, but my first time in the Polaris bulkhead. The seat again had the Saks Fifth Avenue blanket, pillow and menu. And I almost forgot, headphones inside the cabinet. Settling in, the footwell was really big. I had thought the non-bulkhead footwell was big in Polaris, but the bulkhead was even bigger. Again a comfortable, private seat. The flight attendant immediately arrived to offer a PDB. I asked for sparkling wine, which was promptly served. Already better service than on the outbound. 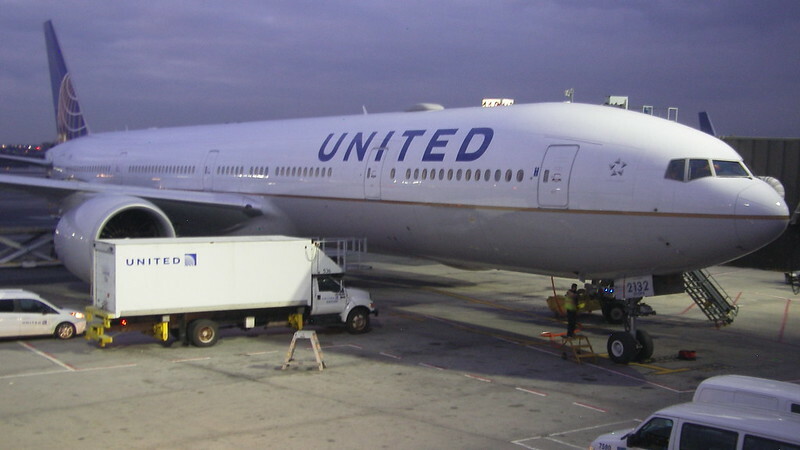 Many passengers boarding seemed unaccustomed to flying on a large widebody, having overlooked the signs directing different seats to different boarding doors and having to awkwardly cross over through the galley. Actually the galley looked to be forward of L2, but there was also a cut-across area at L2 which appeared to be the inflight snackbar area. Enjoying my sparkling wine, I turned on the IFE, which was enabled on the ground. It showed only a short 4h17 remaining! It's so hard to get a nice long flight! Only 4h17 on one of the longest available routes in the lower 48 states. With the shorter-than-expected flight time today, I decided to begin my first movie on the ground. It was only 08:00 with boarding still continuing, and a half-hour till scheduled departure. My first movie was School of Rock with Jack Black. The amenity kit was delivered, and then the captain's welcome message advised a very short flight with tail winds in excess of 150 mph, arriving 30 minutes early. We were also expecting turbulence for the first half-hour. My flight attendant was back to ask for my first and second choice for the main entree. I requested the Baked Egg White Pastry with roasted red pepper sauce and Canadian Bacon. The safety video was played, and then the captain advised a problem with the baggage: 30 bags were missing and not onboard. He decided to delay here to find them, since we were going to be 30 minutes early on arrival anyway. Our pushback was at 08:52. We taxied into position but had a long wait for takeoff. Takeoff was from 1R at 09:18 as a United Express E175 took off alongside from the parallel 1L. We kept pace with the E175 until it obviously lifted off before us. 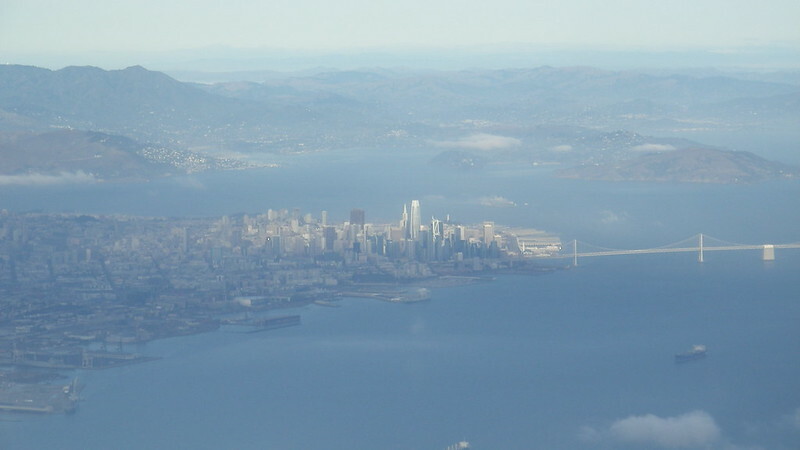 It was a beautiful clear day offering good views of San Francisco, the Bay Bridge, and even the Golden Gate Bridge in the distance. As we crossed 10,000 feet, an announcement was made to describe the credit card offer, and then the first officer reminded everyone of the upcoming turbulence. He was still expecting an on-time arrival into Newark despite the late start. I was the first to be served a very hot towel. To begin service I requested an apple juice. My meal was served; I again got my first choice entree, which came with hot sauce on the side. It smelled good, and my apple juice was continually refilled. The entree was ok. It was time for a bathroom break; I still liked the double-size lav at 2L, but there was a decent line taking up the whole galley and extending into the aisles near the bulkhead seats. Another problem besides the people congregating there was that nearly everyone who used the 2L lav allowed the door to swing all the way open and bang into the wall just ahead of my seat. We had 3h to go in flight when I began my second movie, All the Money in the World. Full-size water bottles were delivered. We now had 2h to go, and I was in the middle of my second movie. There had again been no further service after the meal, so I decided to head up to the galley to ask for the second craft beer, which I had missed on my first flight. I asked for the Goose Island, and the flight attendant brought it to my seat. 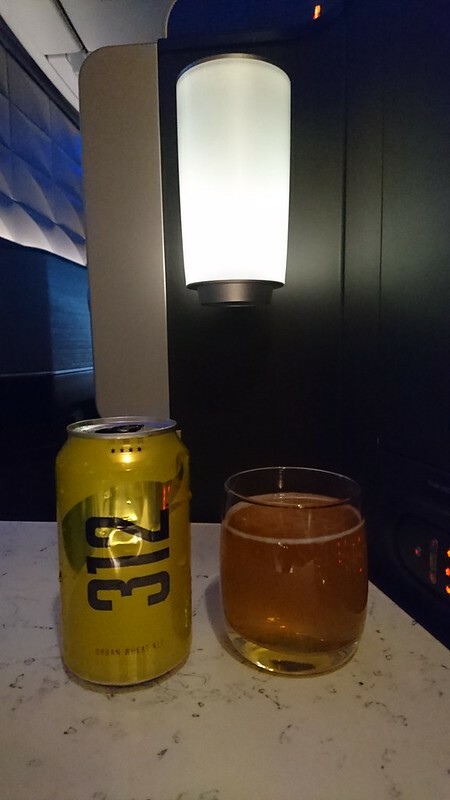 It was Goose Island 312 Urban Wheat Ale, not Midway IPA as shown in the menu. 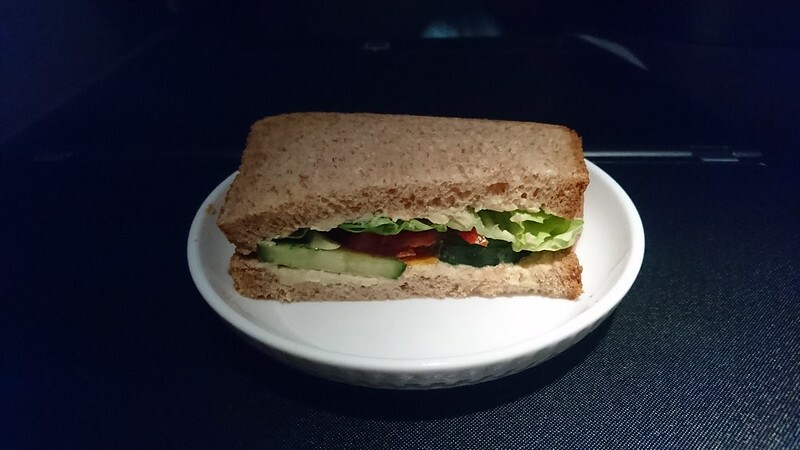 At 1.5h to go, a pre-arrival meal was offered: either a cucumber hummus sandwich or a turkey wrap, along with an offer of drinks. I was glad they made a pre-arrival meal offer this time, along with the extra drink service. The cucumber hummus half-sandwich hit the spot nicely, along with my Goose Island 312. With 45 minutes left inflight, my movie finished, and one last offer of drinks was made before landing. Landing was to the south on 22L at 13:38, and we arrived to Gate C110 (same gate as I departed from) at 13:45, or 16:45 Eastern Time. We had had a good level of service this time, exactly which one would expect. 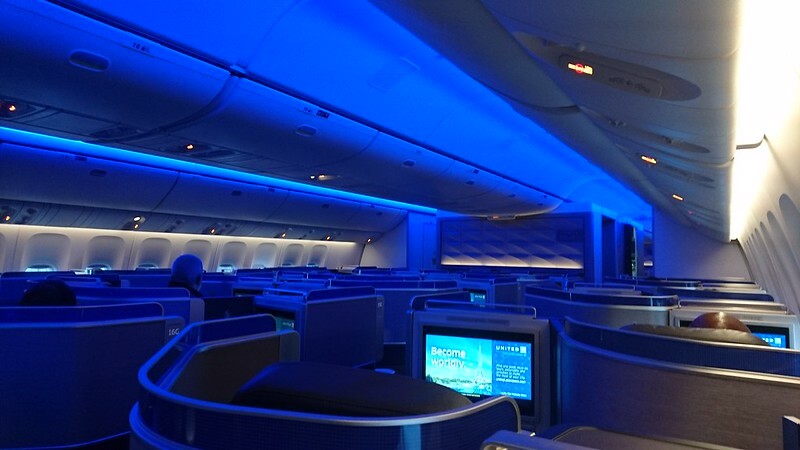 It had been a very good flight, with the excellent seats and a good level of service. 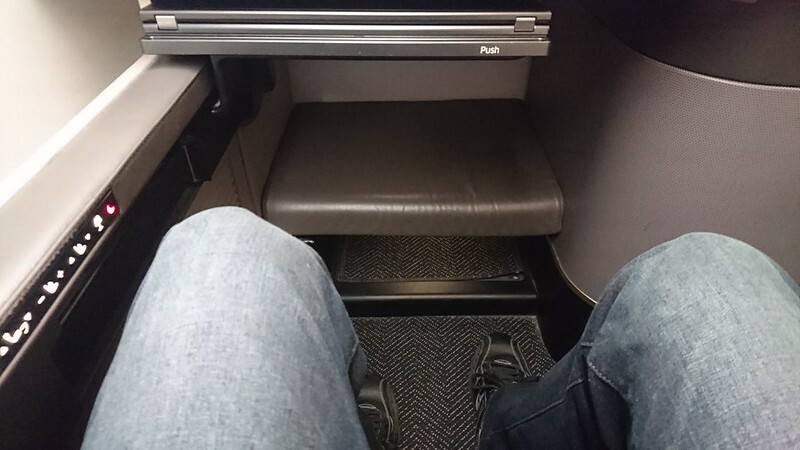 The bulkhead footwell was very large, but considering the additional noise of the galley and everyone using the restroom just ahead, plus the restroom door slamming open into the wall, I don't think I'd pick the bulkhead again. The increased footwell size isn't worth those drawbacks, when the non-bulkhead footwell is also quite large. And so what was my opinion of the 2018 United P.S. 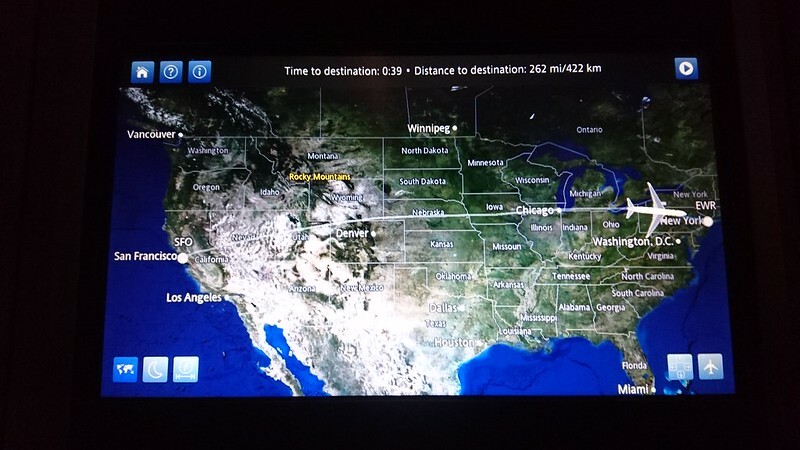 "Premium Service" transcon, compared to my initial 2015 experience? 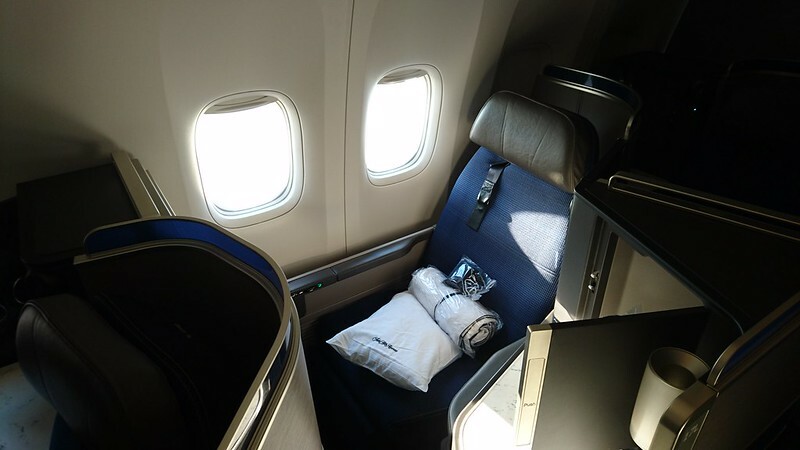 Overall I enjoyed the flights, in the Polaris seats, among the top business class products offered by any US flag carrier. The hard product was therefore top-notch. The soft product on the outbound, though, was lacking. The meal was very good, and at a relaxed unrushed pace. But half of the flight had no service whatsoever, plus the lack of pre-departure beverages and also no pre-arrival snack or service of any kind. 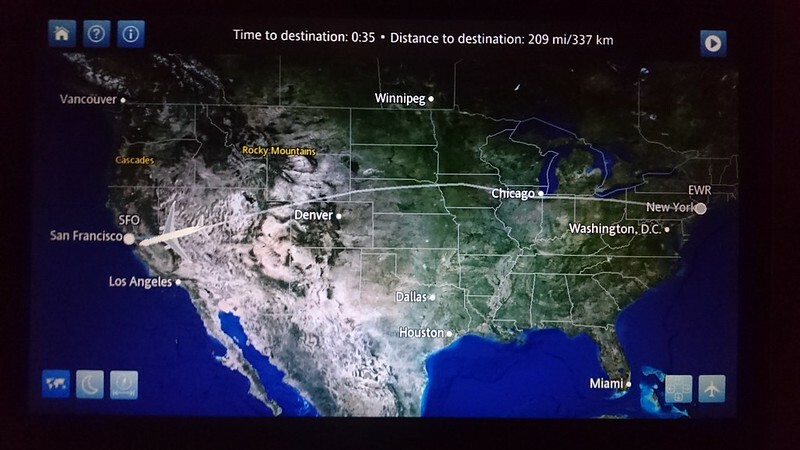 For a six-hour premium transcon, service was definitely lacking, even compared to standard non-premium flights half the length. The return flight was better, with PDB, the initial meal service, and then the pre-arrival meal and drink service. Then again even that flight's service was only the same as the non-premium transcon flights I'd taken into Philly on American or Alaska. So unfortunately, while I did enjoy both flights, the main reason for enjoyment was the not-normally-scheduled Polaris seats as opposed to the service. Indeed, when compared to only three years ago, the service was to a much lower standard this time around. Nice report and a good balance between details and pictures! Thanks! I still find it somewhat sad that UA's brand new business class hard product represents no better than the 3rd best J product AA offers. They really swung and missed with this, I think, especially when you consider the removal of F.
Nice report and photos! I found the Polaris seat to be rather claustrophobic when I tried it, not sure I'd want to spend double digit hours in the thing, even though it is obviously better than the cheap seats. As longhornmaniac says AA's 77W seat is far superior, IMO. AA get slammed a lot here but on the transcontinental flights I think AA offer a much better product, especially in First, and in some cases in Business too. Flagship Lounges at both ends are superior, plus T8 JFK over EWR is a no brainer. 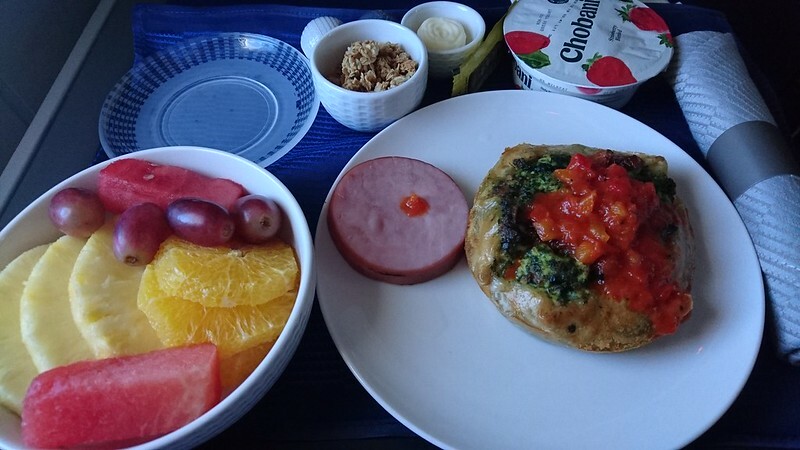 The food I've had on AA J transcon is way better than anything I've had on United, even in Global First on longhaul! 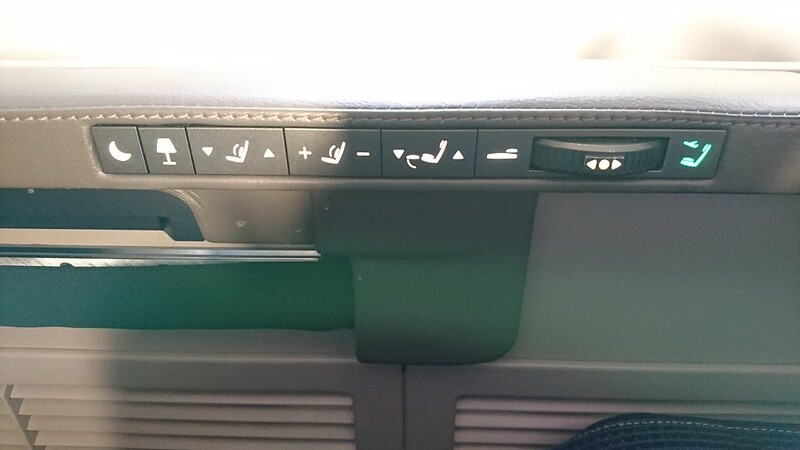 The Polaris seats does fall somewhere between A321T J and F, IMO. And that boarding order, God, it has been a while since I flew UA but that boarding order is awful and chaotic. 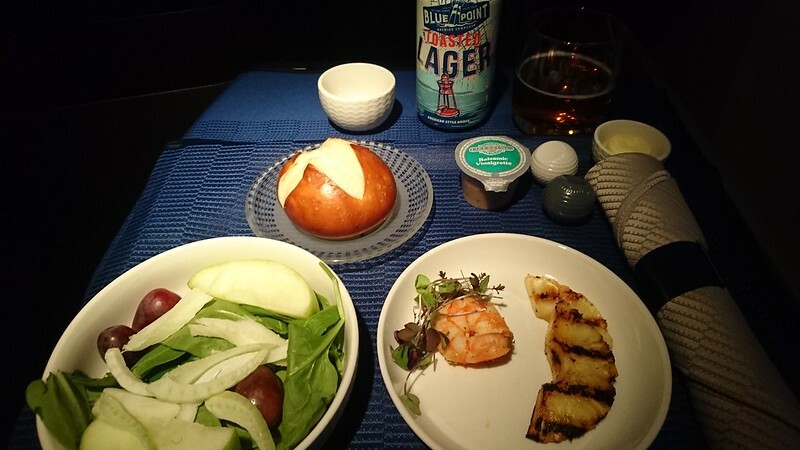 AA definitely serves the superior product NYC-LAX/SFO. B6 is probably the second best and DL/UA are at the bottom of the pack.